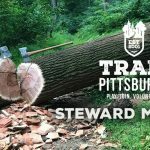 Trail Pittsburgh is bringing together our Stewards to better understand how we can work together and help each other in 2019. This meeting is open to everyone, and we encourage people who are interested in becoming Stewards to attend. *Monthly meetings will be at The Wheel Mill on the first Tuesday of the month from 6:30 pm to 8:00 pm.